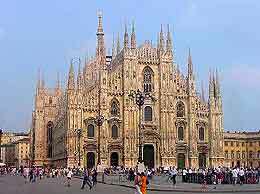 Milan Malpensa Airport (MXP) is served by many domestic and international airlines, flying to and from the region of Lombardy en route to a range of destinations around Italy and throughout Europe. This is the city's premier air facility, being followed by the smaller airports of Linate and Il Caravaggio (Bergamo Orio al Serio). With two main terminal buildings at Malpensa, airlines usually board from their designated terminals. Terminal 1 serves arrivals and departures and was built in 1998, with a capacity to handle more than 28 million passengers every year, whilst Terminal 2 operates mainly charter flights and is served by airlines such as easyJet. Milan's Malpensa Airport contains two main terminal building, serving a large number of European airlines. The following shows the principal airlines that operate throughout the terminal buildings of Milan Malpensa Airport (MXP).